pH, commonly used for water measurements, is a measure of acidity and alkalinity, or the caustic and base present in a given solution. It is generally expressed with a numeric scale ranging from 0-14. The value 7 represents neutrality. The numbers on the scale increase with increasing alkalinity, while the numbers on the scale decrease with increasing acidity. Each unit of change represents a tenfold change in acidity or alkalinity. The pH value is also equal to the negative logarithm of the hydrogen-ion concentration or hydrogen-ion activity. pH values for some common solutions are listed in the table to the right. The most common method of measuring pH is to use an electrochemical pH sensor. Combination pH sensors are a type of electrochemical pH sensor that feature both a measuring electrode and a reference electrode. The measuring electrode detects changes in the pH value while the reference provides a stable signal for comparison. A high impedance device, known as a pH meter, is used to display the millivolt signal in pH units. Combination pH sensor technology can be used to build different products, including laboratory pH sensors and industrial or process pH sensors. Compared with a typical combination pH probe, differential pH sensors work slightly differently. While combination pH sensors have 2 electrodes, a measuring and a reference electrode, differential pH sensors have 3 electrodes. In the differential design, 2 electrodes measure pH differentially with respect to a third metal ground electrode. This design has the advantage of preventing reference fouling, making it ideal for industrial applications like wet scrubbers. Combination pH sensors in 12mm glass and plastic bodies are commonly referred to as laboratory style sensors. 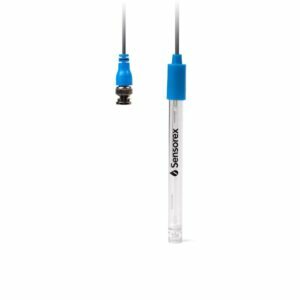 These sensors work well in light duty applications such as education and research, environmental sampling, and pool monitoring. While the basic design is the same, features like the sensor fill, junctions, and cables can be changed to fit different application needs. 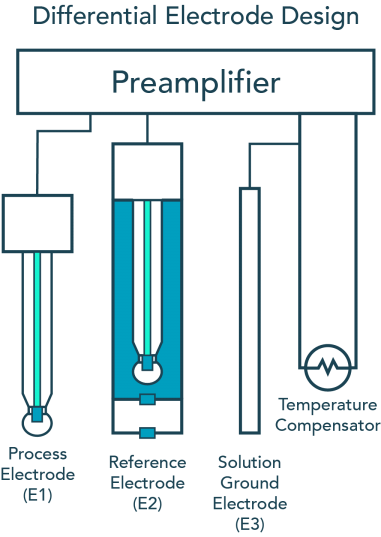 Combination pH sensors can also be built in larger, sturdier bodies with process connections (like NPT threads) built in. 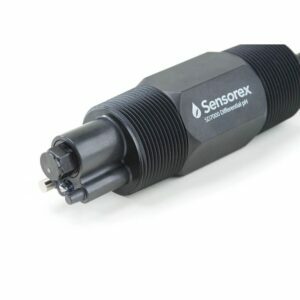 These sensors are commonly referred to as process pH sensors, and they are well-suited for continuous monitoring of pH. Process pH sensors are typically mounted in a pipe, submerged in a tank, or used as part of an insertion assembly. In addition to our standard products, Sensorex designs and manufactures pH sensors for over 250 OEM partners. Whether you are looking to private label sensors and instrumentation or incorporate pH sensors as part of the design for your water treatment product, our team of engineers and application specialists can help you meet your goals. We provide custom branding on our standard products and can design custom pH sensors to meet various design specifications. How are pH Measurements Used? pH measurements are widely used to control processes, ensure product quality and safety.